I finally figured out what Instagram is for. 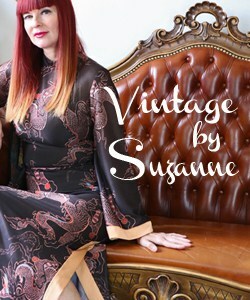 To find new places to buy vintage clothing. Thanks to Beth from One Sweet Thread that I found on Instagram I was able to score this authentic vintage 1960’s style dress in excellent condition. Normally I would stay far away from a sheath dress that doesn’t define my waist, but I was drawn to the neckline on this. This dress is just a titch tight across the stomach/hip area. I can get away with it, but I’d just feel better if I lost five pounds. Go away five pounds. You’re not welcome anymore. Sure you were fun to put on, disguised in the cloak of Christmas cookies, bread and chocolate, but now I’d like you to pack your blubber and leave. I don’t care if I’m being rude. You have overstayed your welcome. 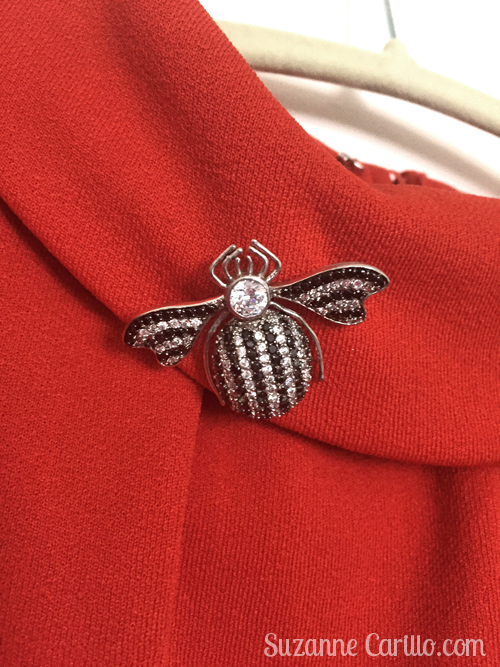 I’m wearing a very sweet vintage insect brooch as well. At least I *think* it is vintage. Sometimes it is hard to tell. 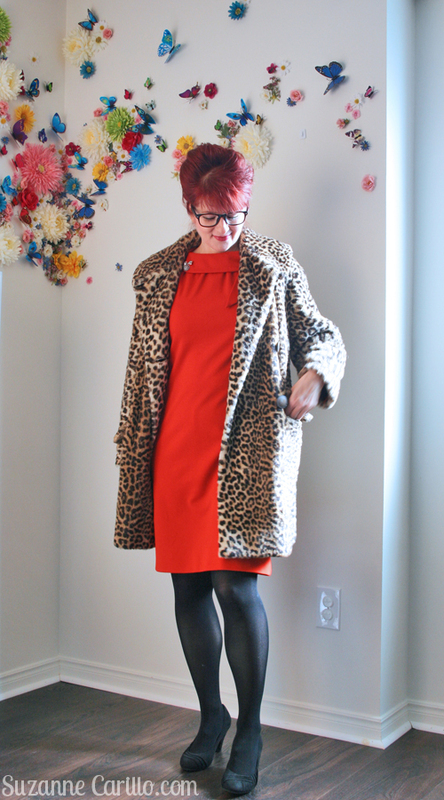 The dress even works with my thrifted vintage leopard coat. I love the cut and colour of this 1960’s style dress. 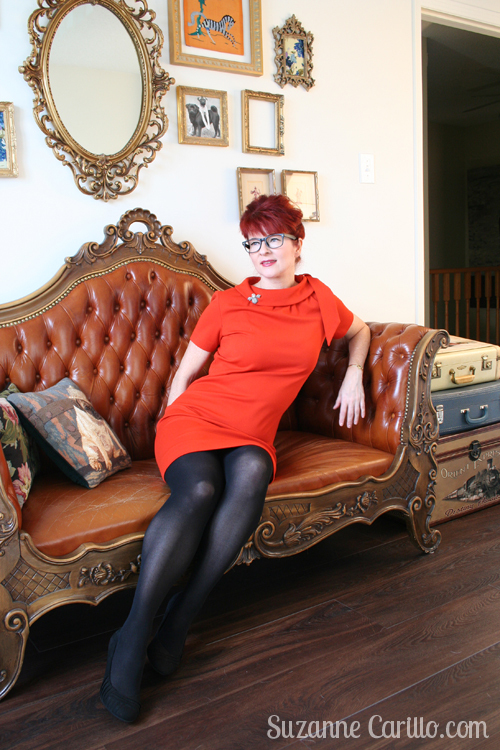 I know many people don’t care for orange, but it is one of my favourite colours to wear. How do you like my pouffy hair? Believe me, getting my hair to stand up like that is no small feat. My hair is fine and thin, but after adding handfuls of mousse to my dry hair, backcombing the crap out of it and hair spraying an inch within my life I was able to change the texture of my hair to borderline thick. Now if I only had the patience to do all of that daily. I blame most of my attraction to 1950’s and 60’s clothing on my favourite series, Mad Men and my Mom who grew up in the 50’s. Do you like any particular era of clothing? If so, why? 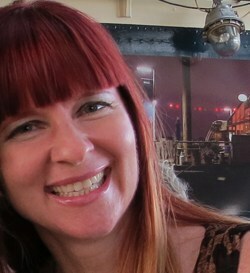 Joan Harris, eat you heart out, there’s a new redhead in town! I could never convince myself to put that much effort in doing my hair, even once. 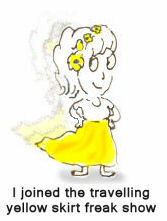 And I grew up in a salon, with a mother and an aunt who were hairdressers! Well, my hair would probably prefer an 80s style (the hair doesn’t care what I think, it has a mind of its own). But still, I admire your dedication, you look fantastic. Gorgeous dress, the neckline is wonderful and your hair rocks! I love orange and it clearly loves you, baby. Thank goodness I’m not on Instagram – I’d go bankrupt. OMG, Suzanne, this dress is AMAZING! Gorgeous design and pretty color. I adore that era and this dress captures it. Like you, I was introduced to women’s fashion by my mother’s generation which wore styles from the Fifties and Sixties; I’ll always hold them up as the ideal. P.S., your hair also looks great. You look like you’re ready for a martini!! (Where is that butler when you need him?) I love the dress and I know I’m getting old (and losing my eyesight) but I don’t see those extra pounds anywhere!! As for the brooch—we are definitely on the same wavelength!! The butterfly wall was an idea brought on by two horrid FREEZING winters. I seriously thought I was going to lose it. So when I had the chance to reno my office I chose to make it perpetually Spring, which is my favourite season of the year. If we had the $ I’d reno the whole house. 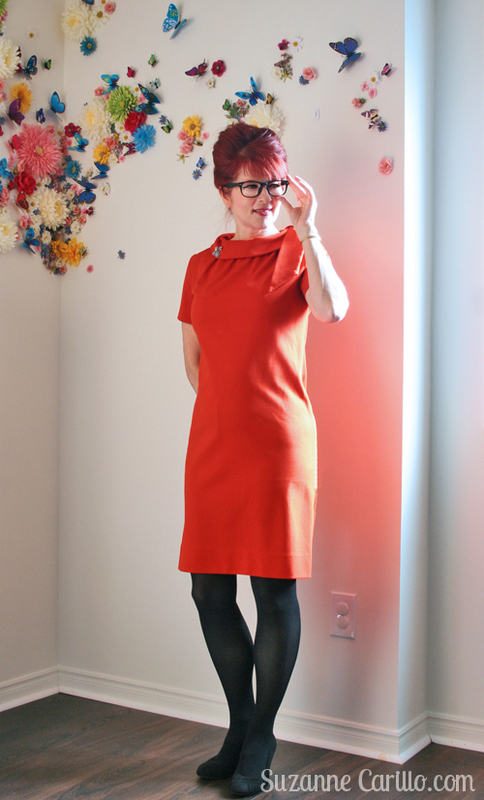 this dress is WONDERFUL and the coat you’re wearing with it, too! I was born in the ’60ies and thanks to my mom know every Doris Day movie by heart – would love to have a dress like the one you’re wearing, even in that color. Gorgeous neckline. We don’t do them today and it’s a shame. I thought you had cut your hair! Love orange if not too yellow. More peach and I’m there. So flattering. That brooch and coat work so well with the rest! That dress is very flattering on you and I love, love, love that rolled collar with the tie.. It certainly doesn’t look like you need to lose any weight. And with that fab bouffant hairdo and leopard coat, you would have to beat that bad boy Don Draper away with a stick! I don’t know if you’re familiar with this brand.But they make some really cute retro tops that remind me of the collar on the dress. I own a few of them and they’re very cute. Oh Suzanne. You look fabulous. Very Mrs. Robinson! When I was a little girl in the 60’s I couldn’t wait to grow up so I could dress like that and when I finally did get older the styles were all no make-up, natural hair, hippie stuff. Thanks for bringing the 60’s back. Groovy Baby. Love it all – dress, hair, coat & brooch! I like 60s dresses and lately started liking 70s clothing (even though I thought I never would at one point). You look fantastic! The dress is too cute. Loved your shoe post. You have such a super style and I love reading your stories. You look like your came out of the set of Mad Men. I love this dress on you and how you styled your hair too!! Seriously, you look like you stepped out of the pages of a magazine. This color is so gorgeous on you, and your hair is spot on . I love the idea of wearing a dress everyday – like the 50’s and 60’s. Such beautiful style back then, and so feminine. Not very practical for my life, but it would be fun to try for a week or two! Oh wow, that dress!! You’re an absolute knock-out in it! I honestly don’t think it looks too tight at all, in fact – buy more of this style, it really works on you. Such a Mad Men glamour puss with the brooch and coat. Yes, Instagram is a nightmare for more vintage temptation…. Suzanne, This is one hot look! I am sure there are a few fellas who would go weak at the knees for this hair piled up…”Take a letter, Miss Moneypenny” style. I am in love with that orange shift. The neckline is a dream and I can see why you had to have it. Lucky you for bagging such a gem! Amazing neckline and I LOVE it with that coat. I shy away from anything like that with no defined waist as well, but that looks so good on you, maybe I should try it!? I love, love, LOVE this look! It suits you well! Your hair looks amazing, the dress is a stunner!!!! This is indeed so much a 60ies dress. I remember them well. Actually, being a tad tight on the hips shows off your waist, which is something you want. And losing 5 pounds is getting more difficult as we get older. We gain weight easier though. I lost 4 kilos half a year ago but it took me two years before I was in that state of mind to perform this task. I totally agree with orange being a lovely colour. I have an orange coat to prove it. And your hair? Well, it is fun for a change, but I like it the way you usually wear it. Fabulous! Seriously fabulous! This is hands down, my favorite look ever. Now I need to go add her to my instagram feed or maybe not (if I want to be good and not keep spending). And I was just about to ask how you did your hair and then I read on, I’m still going to give it a go, love it! see this is what I am talking about, when you wear this stuff, I like it! You are doing three things here I normally, absolutely do not like. 60s dress (check), orange clothes (check), and back combed beehivish sort of hair (check). I am not having bad visuals or wanting to puke seeing 60s fashion, thank you for pulling me out of my nightmares of the 60s styles. Yep and of course the leopard coat, so cool. Love this look. The dress, the hair, the coat. Very flattering! I guess I’m mainly a boho-kinda girl, not a certain era kinda gal. I know I saw this outfit on IG but I must have missed it here. 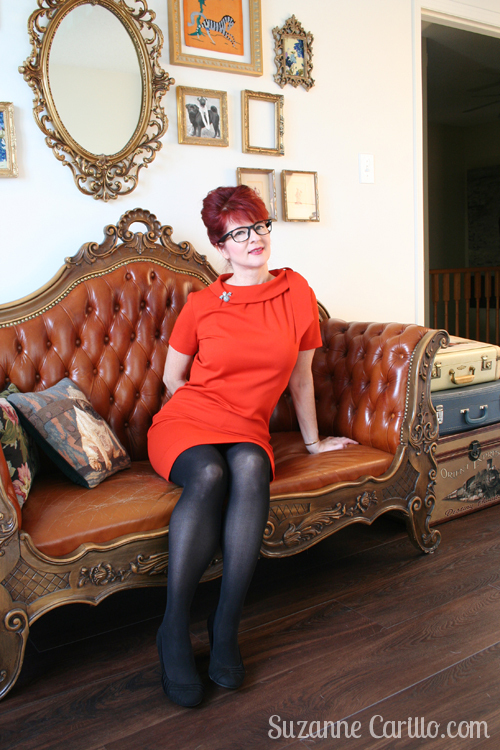 Orange does look marvelous with your hair and you are definitely channelling your inner Joanie here. I’ve found so many vintage stores on IG too, and have gone so far to scope out their websites, but haven’t bought anything. I like bits and pieces from different eras – the tailoring of the 40s, the patterns of the 60’s, the shapes of the 80’s, etc. Oh, I love it all! The color, the neckline and then, just when I think it can’t get any better you add that coat! You look like you stepped out of Swinging London’s Carnby street but at the same time don’t look like a time traveller or in a costume at all. Personally, I tend to be drawn to 50s style clothing. Not the lifestyle women would have had to have then nor the politics of the time, but I like Doir’s New Look.